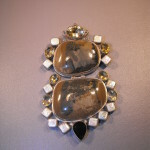 Jan Michaels at her best. 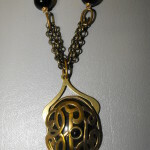 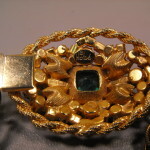 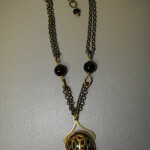 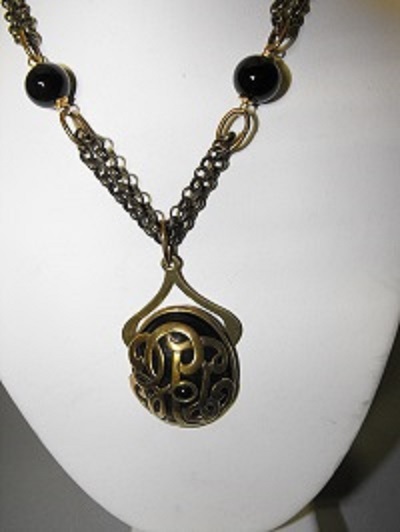 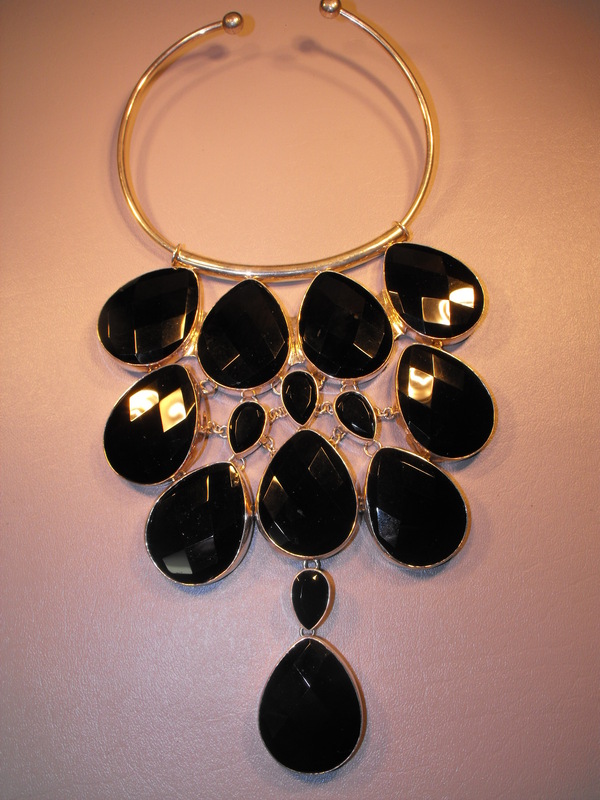 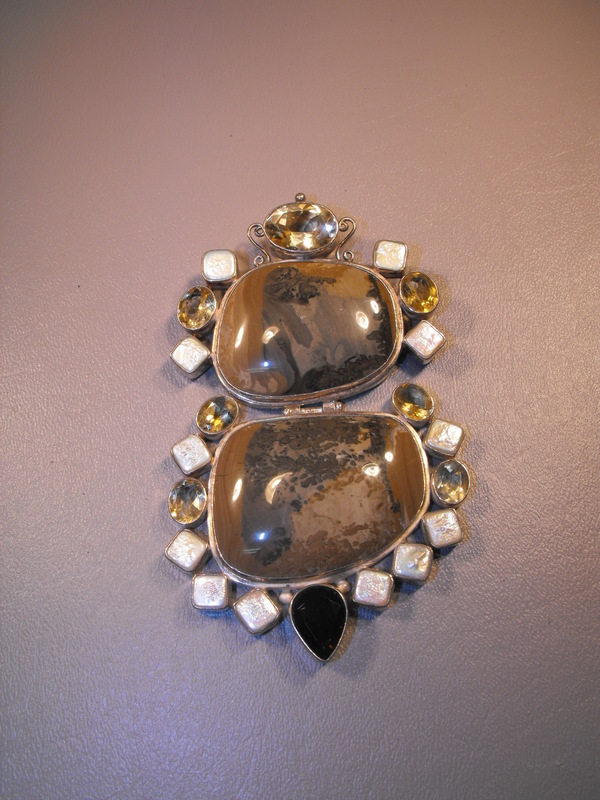 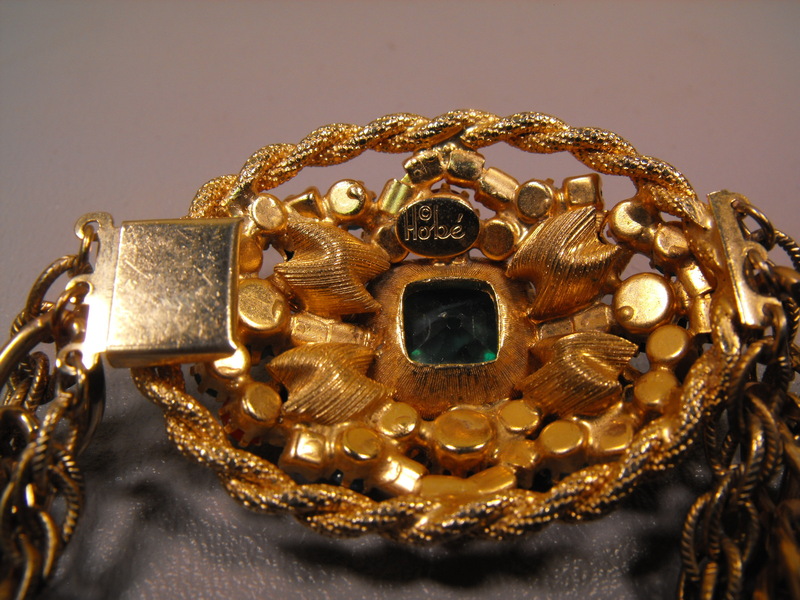 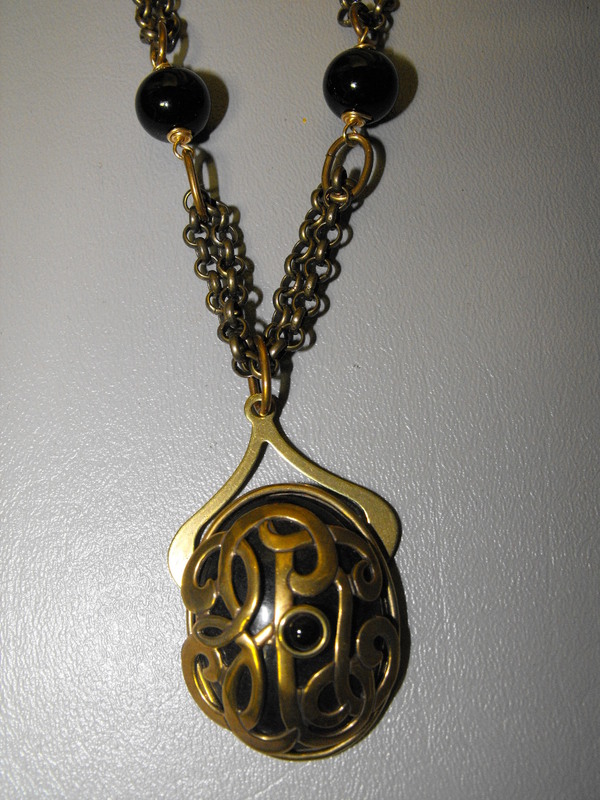 Here is a wonderful black Onyx and brass necklace/pendant with a definite Art Nouveau design. The double chain necklace is accented with Onyx beads and culminates in an Art Nouveau monogram design pendant against a black Onyx background. 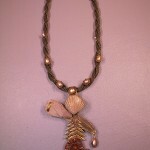 The necklace measures about 9″ in length with a 3″ extension chain. 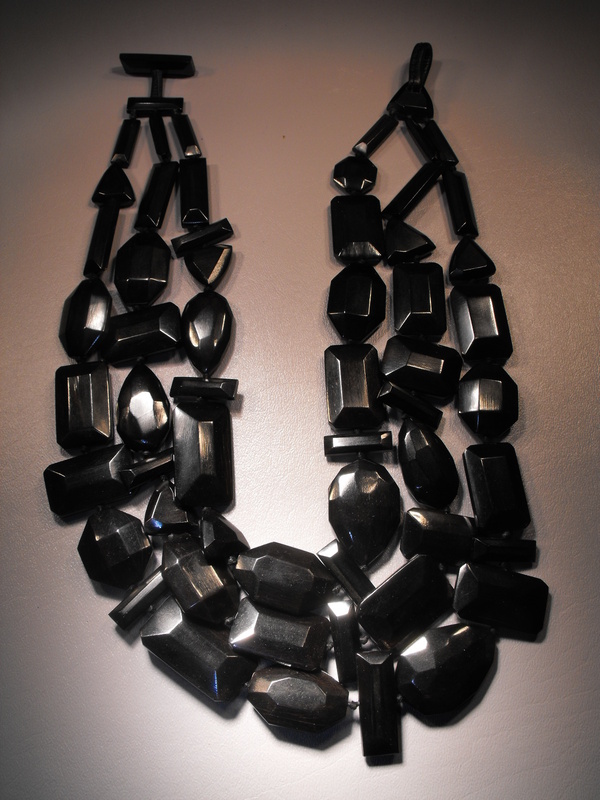 Make a statement in a “nou” way. 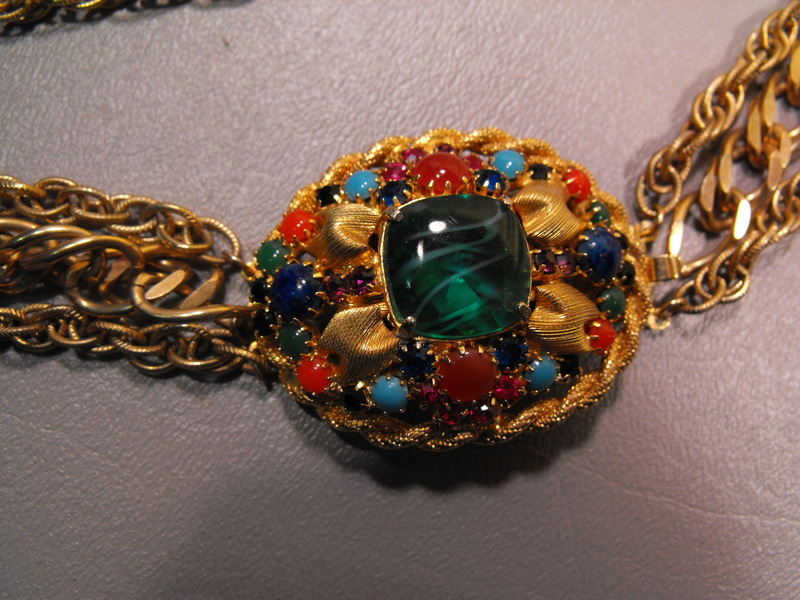 # 4462 Price: $110.00 Sorry, this has been sold. 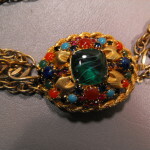 For a larger view,please click on photos below. 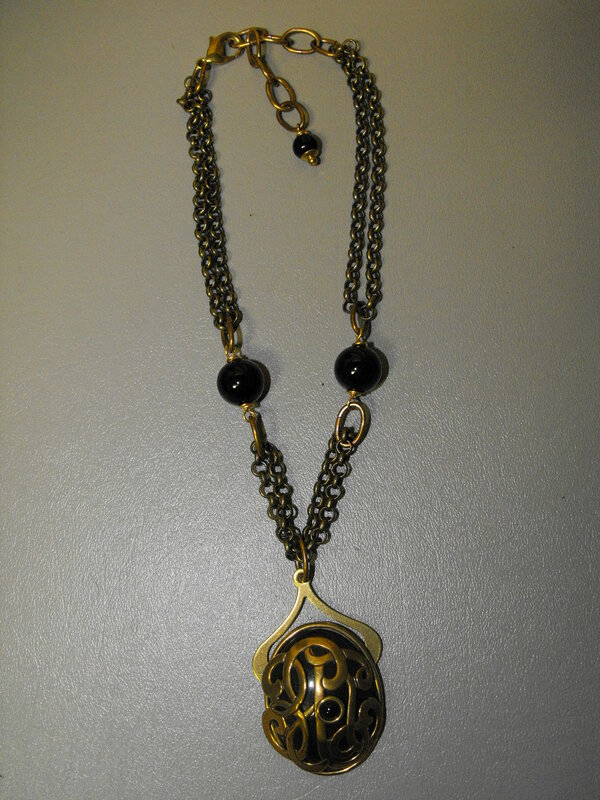 A beautifully crafted tribal necklace designed by Jan Michaels which features Pineapple Jasper with brass geometry. 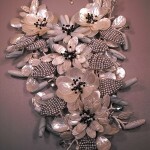 Jan Micheals creates some of the best artisan designs in this country. 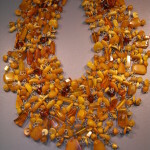 Each piece is very unique utilizing natural materials. 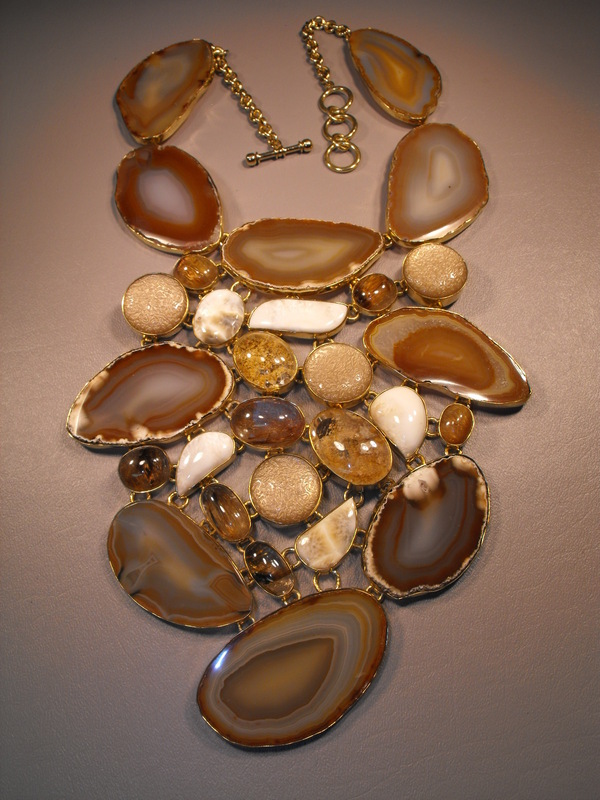 The necklace measures about 12″ long with a very generous 5″ extension chain. 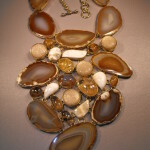 One of the easiest ways to make a statement. 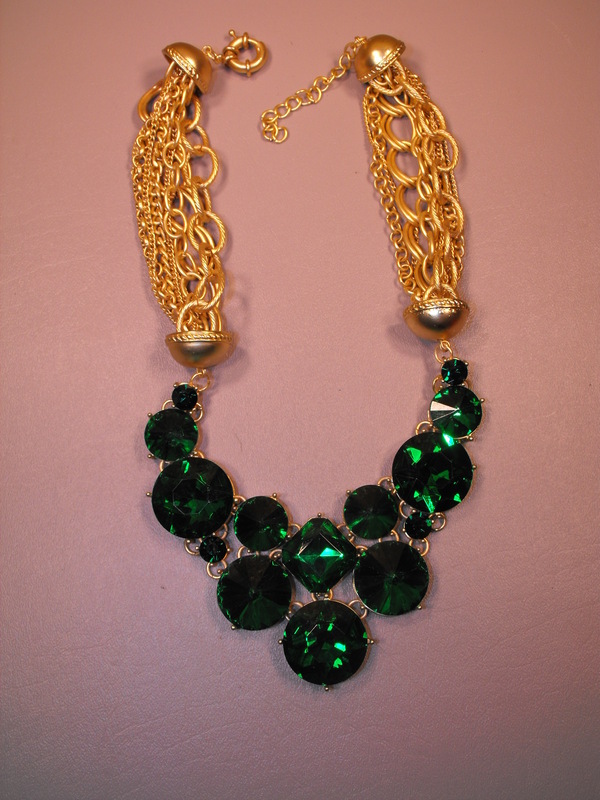 In this case it’s very easy to be, wear and look green with this terrific bib type necklace. 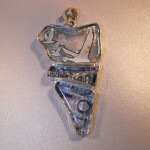 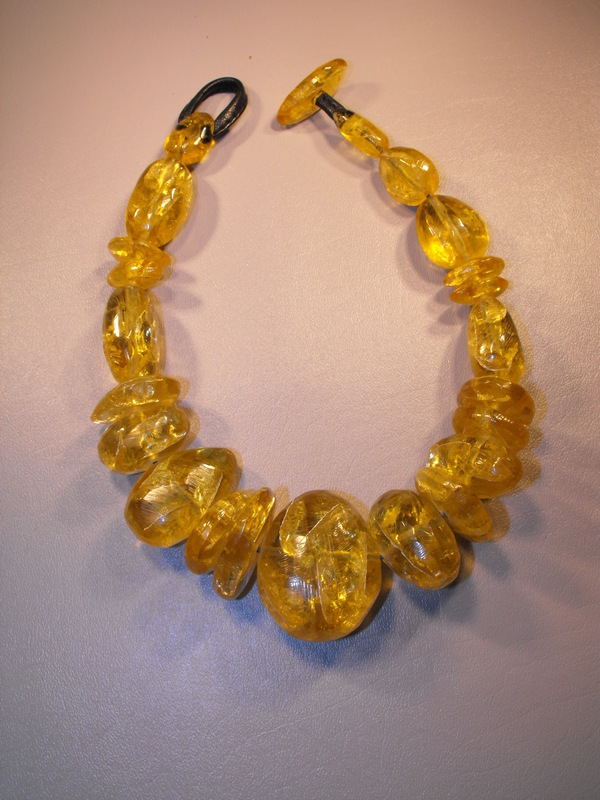 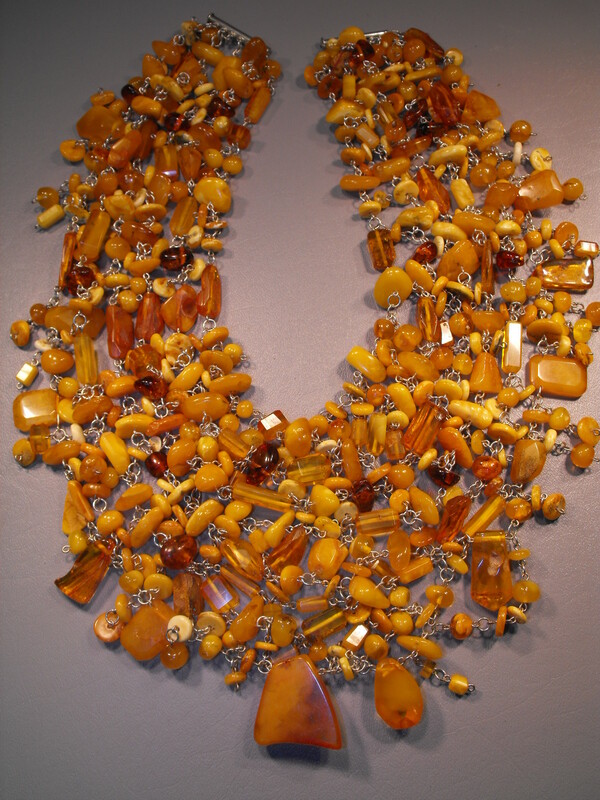 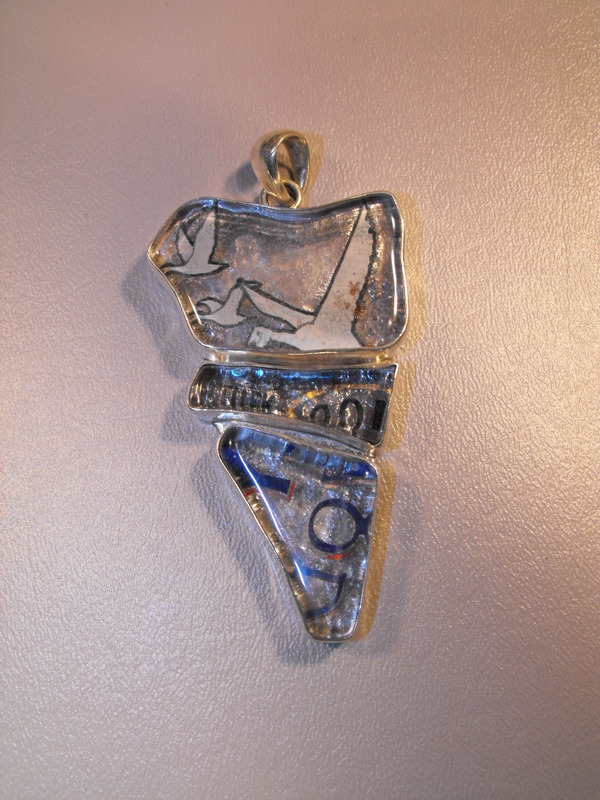 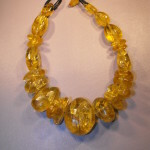 It consists of faceted Lucite stones of varied shapes and sizes with varied sized 9 strand metal chains for the neck piece ending in a life preserver clasp. 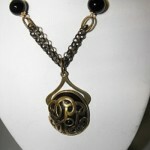 The total length is about 10″ and has a generous 3″ extension chain. 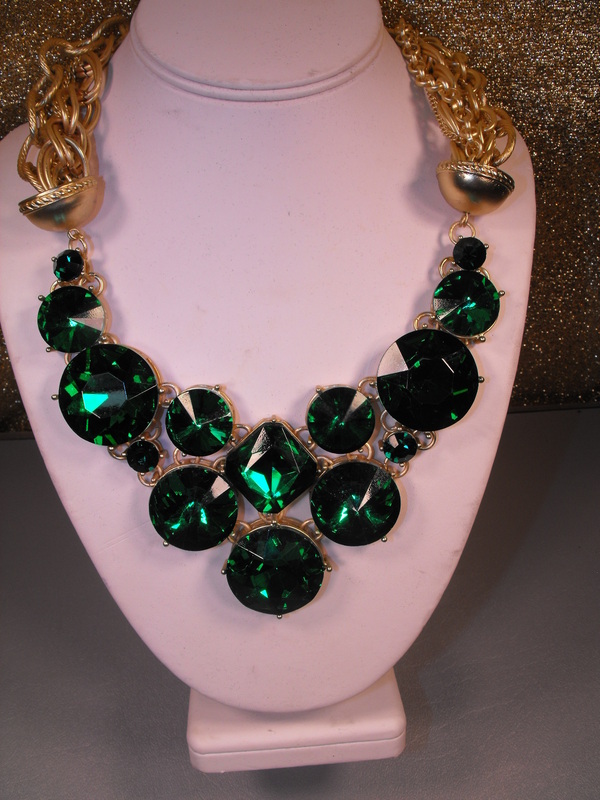 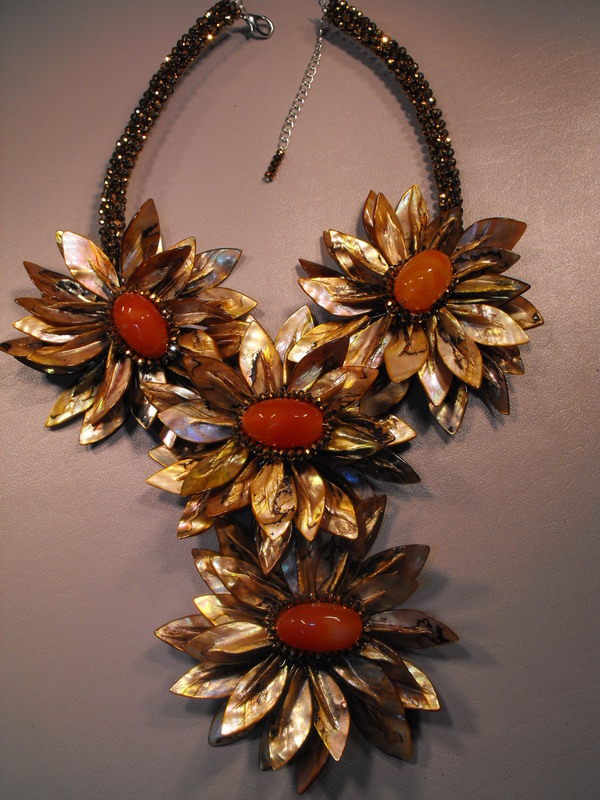 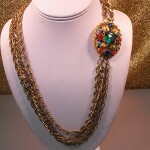 This statement piece will make your friends “green” with envy! 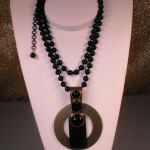 If you want to make a statement this is the way to do it. 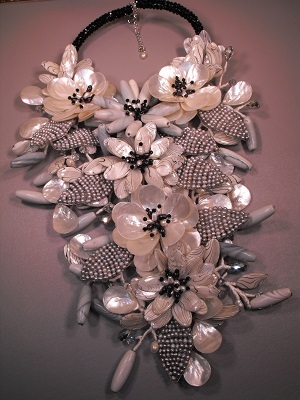 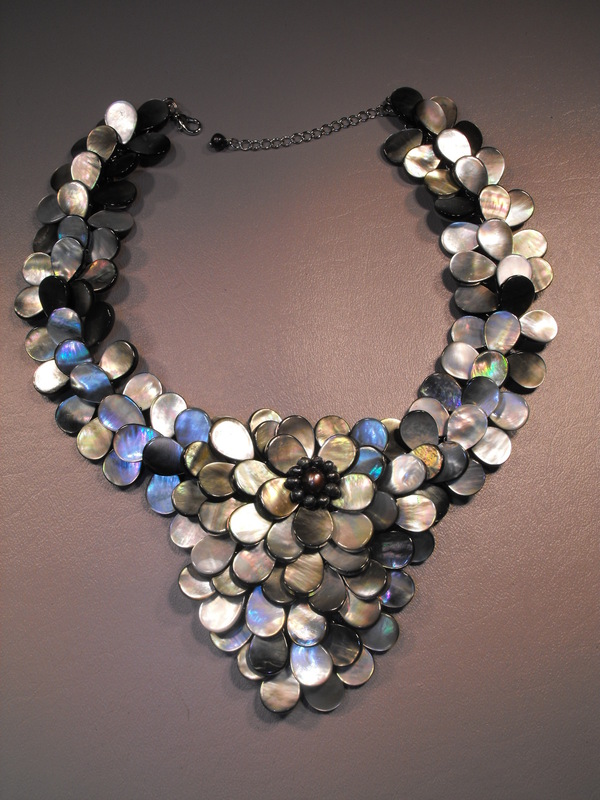 This necklace consists of a combination of Zebra glass and Mother Of Pearl Florettes cascading down and accented with Mother Of Pearl petals and gray Freshwater Pearls in a leaf motif. 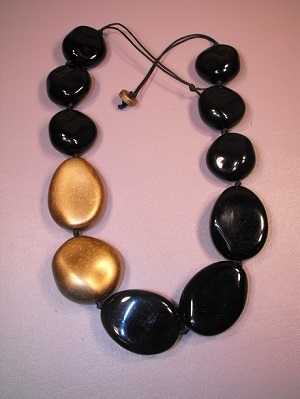 In the center of the florettes are black Onyx beads. 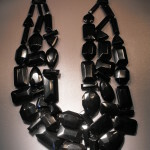 The neck piece consists of black Onyx beads in a rope style. 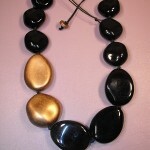 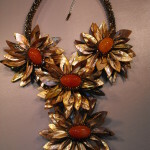 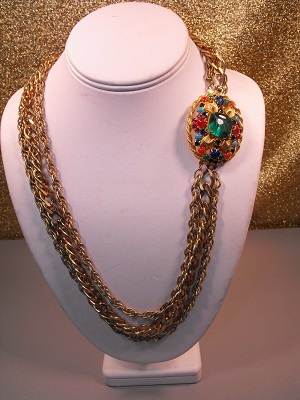 The total length of the necklace is 17″ and the widest portion measures about 10 ” wide. 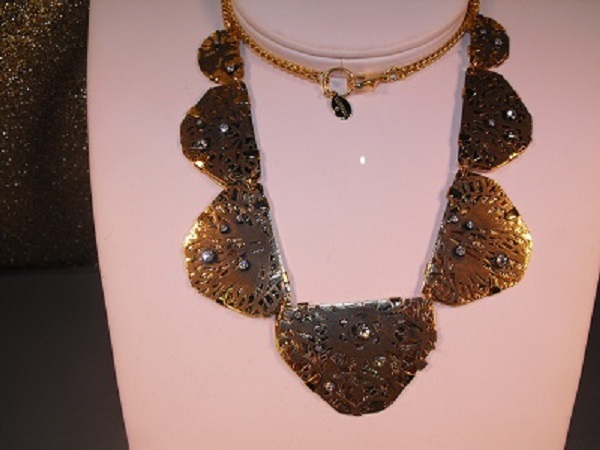 Wow…..what a statement is all we can say ! 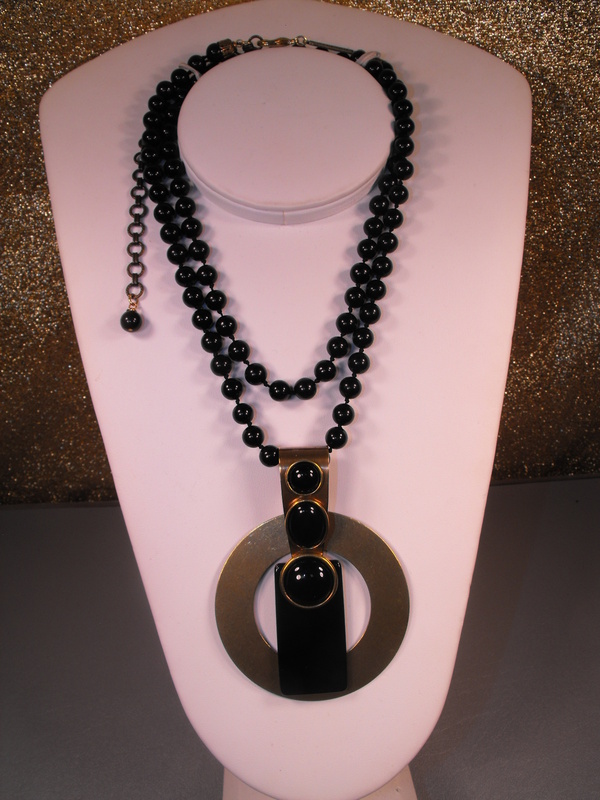 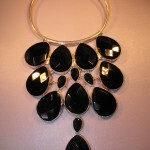 Here is an asymmetrical piece displaying two chunks of gold acrylic and nine chunks of black shiny acrylic all coming together to form a very elegant necklace. 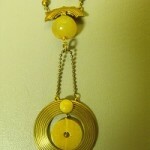 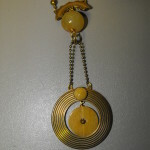 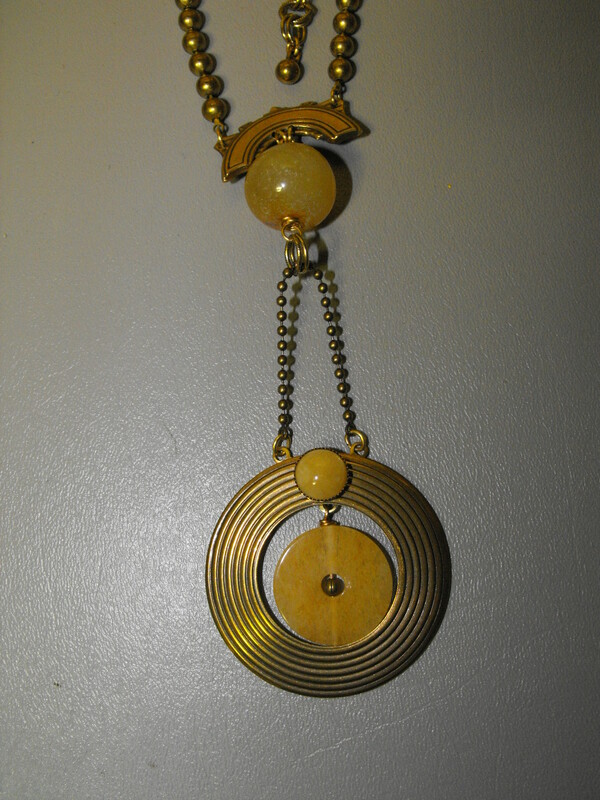 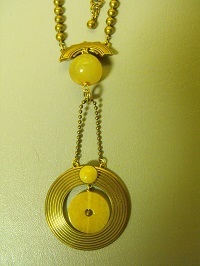 The necklace is about 10″ in length with a button & hook clasp. 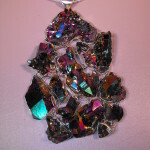 The largest chunks are about 2″ in length each. 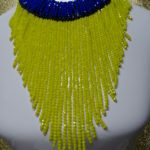 This is what as known as an easy statement to wear. 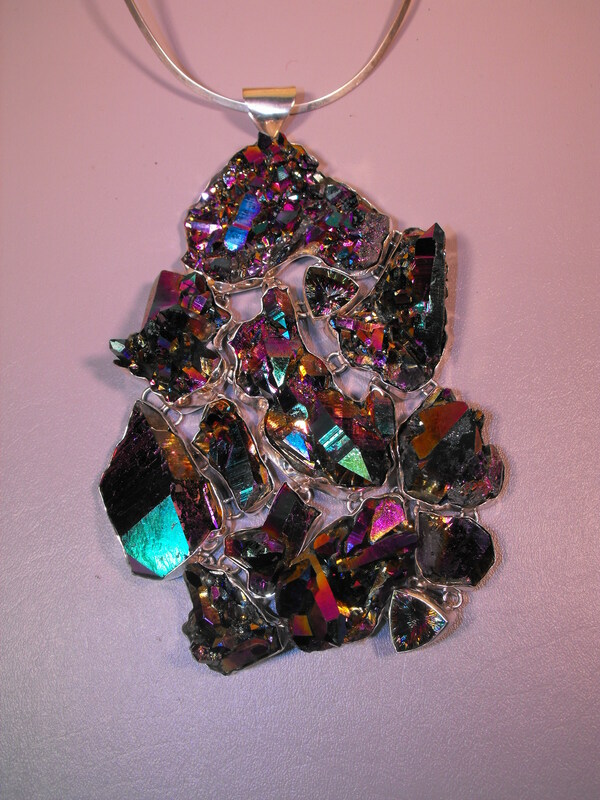 For a wider look, please click on photo below. 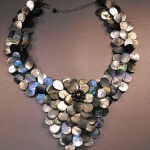 This necklace consists of hammered irregularly shaped circles all interconnected and graduated in size. 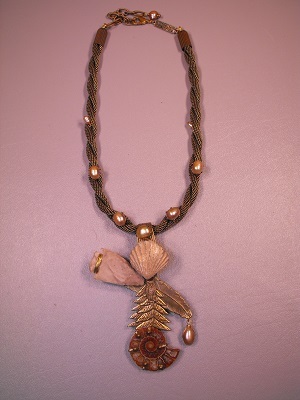 The necklace is about 9 1/2″ long and has a 2″ extension chain with a lobster claw clasp. 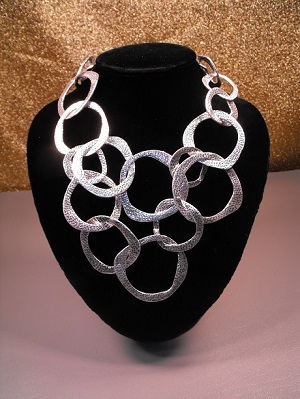 This necklace is very easy to accessorize at any time of the year. 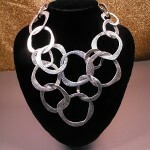 Make a large circular statement.